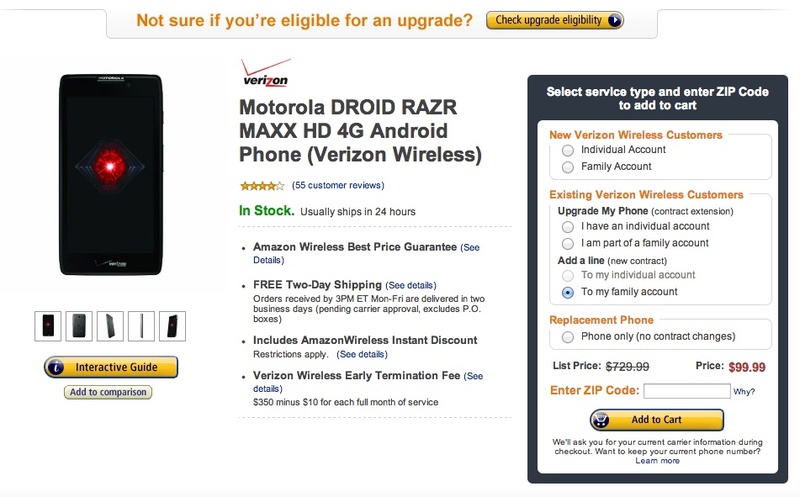 This morning, Amazon dropped the price of the DROID RAZR MAXX HD to $99 on-contract for new lines and new accounts. If you want to upgrade to it, it’ll run you $149. Either way, it’s still a hell of a lot cheaper than the $299 on-contract price that Verizon is still listing it at. We reviewed the RAZR MAXX HD back in October and are clearly fans of it. While its specs and performance may not match up to the Note 2 or DROID DNA, it crushes them all in battery life. In fact, we took MAXX HDs to Vegas with us to cover CES because at most conferences, you are almost always needing to plug in your phone or find the nearest charger multiple times a day. With the MAXX HD, I never once ran into a battery issue even after a half-dozen live blogs, a bunch of photos taken, and regular usage. It’s a beast, that’s for sure.